Rather, the main reason is I’m passionate about psycho-education and there’s a whole host of fascinating topics I’d prefer to be writing about (issues I’d like to cover in 2018 include the vicious cycle underpinning depression; cognitive distortions and the multitude of thinking errors that get us into trouble in day-to-day life; exposing oneself to fears and dealing with social anxiety, health anxiety, OCD and phobias; understanding self-harm; the psychology of jealousy; insomnia; the four main causes of school refusal behaviour; why therapists should stick to evidence-based treatments rather than going with their gut; and why CBT, unlike other psychotherapies, largely focuses on the here and now rather than the distant past). The above topics mightn't sound fascinating to many readers, but those columns will have their fair share of "aha" moments. But new year resolutions? Sorry, but most of you won't keep them anyway (the research is unequivocal here). Anyway! On that underwhelming note, let's get started. Psychologist Dr Judith Beck, whose father Aaron founded CBT, offers some commonsensical advice on the subject, namely to make sure one's goals are realistic; to break down big goals into small steps; to problem-solve difficulties that interfere with implementation; and to respond to sabotaging thoughts that get in the way. The main reason people fail with resolutions is they tend to be unrealistic. People fall prey to "false hope syndrome"; they want to do too much, too soon and underestimate the difficulty of the task. People tend to focus on goals they have failed to achieve in the past; it's a goal for 2018 because you failed to achieve it in 2017. 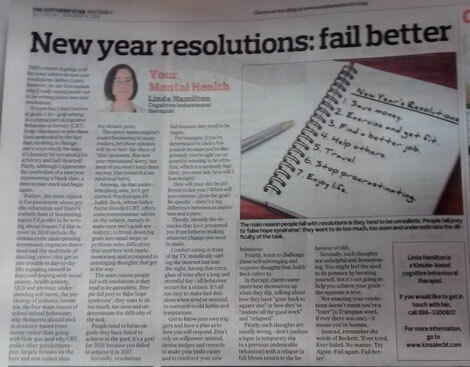 Secondly, resolutions fail because they tend to be vague. For example, if you're determined to shed a few pounds because you're dangerously overweight (as opposed to wanting to be ultra-thin, which is a seriously bad idea), you must ask: how will I lose weight? How will your diet be different to last year? When will you exercise/go to the gym? Be specific – there's a big difference between an aspiration and a plan. Thirdly, identify the obstacles that have prevented you from hitherto making whatever change you want to make. Comfort eating in front of the TV, mindlessly surfing the internet late into the night, having that extra glass of wine after a long and stressful day – all behaviour occurs for a reason. It's all too easy to make bad decisions when tired or stressed, to succumb to old habits and temptations. Get to know your own triggers and have a plan as to how you will respond. Don't rely on willpower: instead, devise nudges and rewards to make your tasks easier and to reinforce your new behaviour. Fourth, learn to challenge those self-sabotaging and negative thoughts that Judth Beck refers to. In therapy, clients sometimes beat themselves up when they slip, talking about how they have "gone back to square one" or how they've "undone all the good work" and "relapsed". Firstly, such thoughts are usually wrong – don't confuse a lapse (a temporary slip to a previous undesirable behaviour) with a relapse (a full-blown return to the behaviour of old). Secondly, such thoughts are unhelpful and demotivating. You might feel the need to do penance by berating yourself, but it's not going to help you achieve your goals – the opposite is true. Not enacting your resolutions doesn't mean you're a "loser"(a Trumpian word, if ever there was one) – it means you're human. Instead, remember the words of Beckett: 'Ever tried. Ever failed. No matter. Try Again. Fail again. Fail better'.